Lead MEP/FP design firm on expansion of 2 million square foot facility. Project involved new construction for Hall A including a 60,000 square foot ballroom and 10,000 square foot Conference Center and Lounge. HVAC chiller plant upgrade includes 12,000 ton chiller plant with eight (8) new chillers and integration of Phase I, II, and III systems with variable primary/secondary flow optimization. Design and construction administration of new west side replacement stadium including new press box facilities, new club level seating area and stadium seating areas including new meeting facilities, concession areas, food preparation and 3 story atrium with advanced smoke evacuation system. Four-story Basketball Arena/Education Complex Building at McNeese State University in Lake Charles, La. (Calcasieu Parish), 145,820 square feet, consisting of a 4,100 seat basketball arena with concessions and suites, practice gym, training and locker rooms, administration spaces, multipurpose room, and classrooms. The building is fully sprinklered and is conditioned with air-cooled chillers, hot water boilers, and variable volume air handling units with hot water heat. A smoke removal system was provided for the main arena. When Hurricane Katrina devastated the Louisiana Superdome on August 29, 2005, the State of Louisiana selected a team of A/E professionals including Associated Design Group, to develop repair plans. ADG prepared the MEP/FP portion of the repair plans and provided the oversight of MEP/FP repairs and upgrades over the 7 month reconstruction. A 165 million dollar repair project was designed/bid/installed in the 7 months leading up to the successful Monday Night debut, September 25, 2006. Enhancement costs were approximately $100 million dollars. ADG continues to act as consultants to this facility. For our Engineering work on the Superdome, ADG was pleased to be recognized by the American Council of Engineering Companies (ACEC) in a black-tie event in Washington, DC, where we received National recognition for the ENGINEERING EXCELLENCE in regard to our work at the Louisiana Superdome. New facility positioned on the bank of the Ohio River in Owensboro, KY. ADG served as MEP/FP design firm on the new convention center. Overall responsibility included prime design and 3D, BIM MEP/FP integrated drawing preparation using Revit® modeling software. Tulane’s Yulman Football Stadium brings “game day” back on campus! This new facility has seating capacity for 30,000 fans, as well as provisions for future expansion. The stadium support facilities include multiple club areas (a total of 28,400 square feet) with bars, food service centers, restrooms, and a catering kitchen. The facility is designed to achieve LEED Silver certification. Energy efficient stadium lighting provides high quality lighting, even distribution and excellent optical characteristics in a cost effective manner. 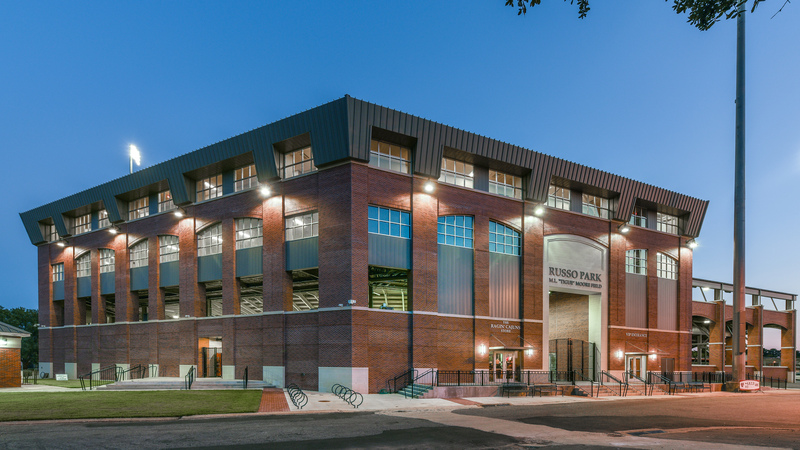 A high efficiency 1500 ton chiller plant is incorporated into the project to serve the stadium chilled water needs together with providing capacity for Tulane’s North Campus. Project involves the addition and renovations to The University of Louisiana at Lafayette's beloved M.L. "Tigue" Moore Field Baseball Stadium. The project will consist of 2 phases. Phase I included the installation of new stadium lighting and was completed prior to the 2016 Baseball season. Phase II includes demo of the existing grandstand, as well as construction of a new grandstand, new concessions, a club room, suites and press box, and 2 concession decks behind the existing baseline stands and will be completed in 2017.